Yesterday I had a treat. 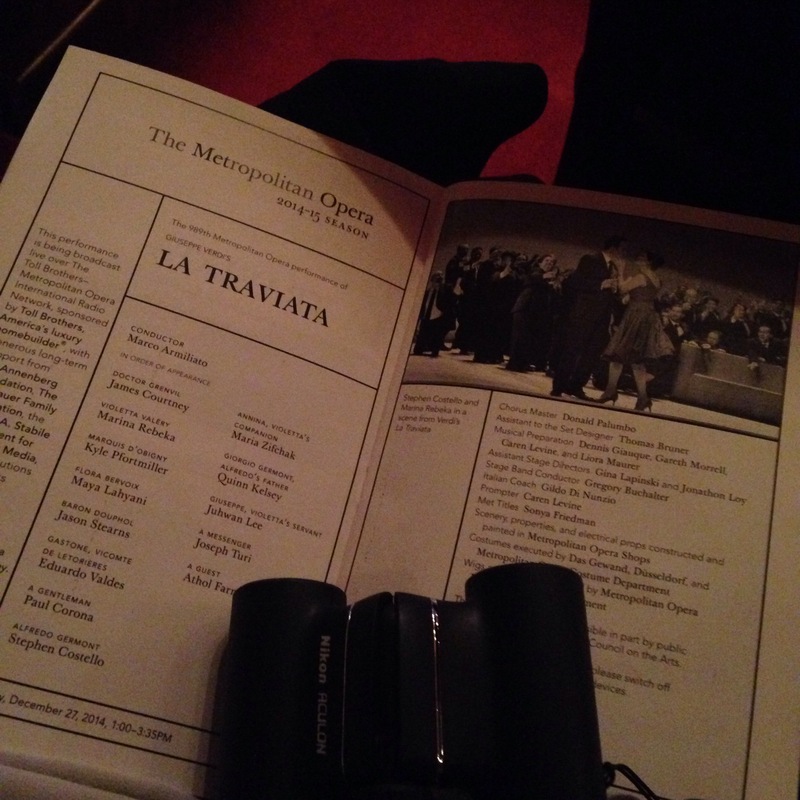 Boyfriend’s family friend has a box at the Metropolitan Opera and invited us to join her at a matinee of La Traviata. Although I’d seen teaser performances as a child and went to a performance of La Boheme at my university, I’d never been to a full-length, professional opera, much less at the Met. I was extremely excited. I was certainly excited to dress up for the opera. I had found a great late-50s green brocade jacket the week before while out shopping, so this seemed like the perfect opportunity to bring it out. We had lunch at the opera house restaurant first, which was delicious. I had a lobster pasta dish, and shared some of Boyfriend’s octopus starter, and the plate of cookies the table ordered. The waiter did try to mess with my tea (Earl Grey) before it was done steeping, but I fixed it. And then, the opera. It was not a traditional staging, but a new one, first premiered in 2010. The stage is almost completely blank, with a huge clock that serves as a focal point, and a man who started the performance sitting on the stage the whole time we took our seats. Boyfriend and I spent a little time with the opera glasses trying to decide if he was real. He was. He was ostensibly the performer who sang the role of the doctor, but he stayed on stage silent throughout most of the play, to represent death. The clock and the death character highlighted that the play is not really about a romance, but about a death. The singing was amazing. Obviously, I’d never seen a full-length professional opera before, but I was amazed at how pure Marina Rebeka, the soprano playing the role of Violetta, sounded. And the baritone Quinn Kelsey as Germont was fantastic as well. And Rebeka’s acting was great as well. I saw that the director really wanted to bring out the pain she was in from the beginning, to make both her facade as a courtesan and her seeming-recovery while in love with Alfredo more poignant. The technical aspect of the play really drove home the vision. Above the curving upper level of the plain white set was a black screen that was replaced with a cheerful floral pattern at the beginning of the second act. When Giorgio Germont comes in to tell Violetta that she must give up Alfredo, and she realizes that he is right, the floral pattern’s colors started to fade to almost completely black and white, highlighting the third-act line about the flowers fading from her cheeks toward the end of her illness. The floral returns again at the end of the third act, as Alfredo returns and she has her illusion, but goes completely red just as she dies at the end of the show. It was very moving. All in all, I so enjoyed my first excursion to the opera. It was a wonderful show, and a fantastic experience. I might have liked to have seen a more traditionally staged opera, but hopefully I will have my chance in years to come!